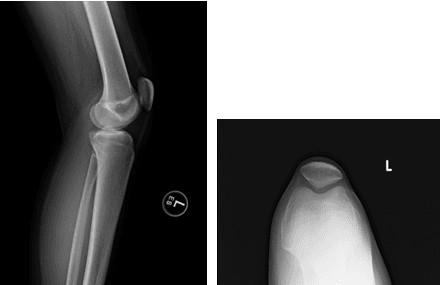 A 16-year-old female patient who is a competitive equestrian presents with painful proximal tibiofibular joint instability of the left knee and numbness and paresthesia in her peroneal nerve distribution. MRI shows proximal tibiofibular ligament injury. She has failed conservative treatment – what’s the next step? Patients with PTFJ instability are often misdiagnosed. They typically present with pain and clunking at the lateral knee as the joint dislocates, [1,3,6] with many patients also having numbness in their peroneal nerve distribution. In severe cases, they may even have weakness in ankle dorsiflexion and eversion. The differential diagnosis is wide and includes lateral collateral ligament injury, biceps femoris tendonitis, posterolateral rotatory instability, and hypermobile torn meniscus . Several surgical techniques have been described in the literature. Initial studies focused on resection of the fibular head or PTFJ arthrodesis, but these methods have fallen out of favor due to postoperative ankle and/or knee pain and instability. [3,11]. Newly published approaches to PTFJ reconstruction include soft tissue reconstruction using split biceps femoris graft and resection of a strip of iliotibial band [7,12,13]. However, these techniques compromise the known soft tissue stabilizers of the lateral knee, are non-anatomic, and are primarily small case studies with limited follow-up [3,6,7]. Thus, the optimal surgical treatment for PTFJ instability is currently unknown. Recently, LaPrade et al [3,7] described a new approach using autogenous semitendinosus graft to create an anatomic reconstruction of the posterior ligamentous structures of the PTFJ. In this article, we present a single case of PTFJ instability surgically treated with this method. 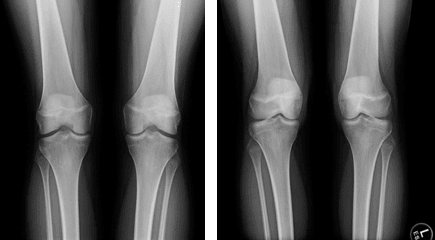 A 16-year-old female patient presented with a 3-year history of very painful tibiofibular joint instability of the left knee. She has experienced paresthesia and numbness down the distribution of the peroneal nerve during dislocation events. She had been an avid equestrian who competed year-round, but the injury has limited her ability to compete. Her symptoms have not resolved despite consulting multiple physicians and trying numerous conservative measures, including a long-leg brace and non-weight-bearing in a wheelchair to allow the joint to tighten, as well as a course of physical therapy. The patient stated that her symptoms mostly flare up when riding horses. She was able to reproduce the instability when she put her knee into a ‘W’ position or assumed a deep squat position. 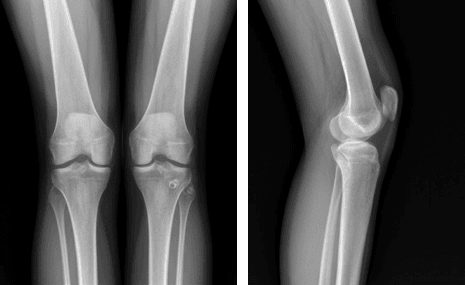 Radiographs done at the initial visit (2 AP radiographs of bilateral knees and lateral and sunrise views of the left knee) were unremarkable (Figure 1). Figure 1. Radiographs from the patient’s initial clinic visit demonstrating near closed growth plates with no other remarkable findings. A left knee MRI was ordered for further evaluation of instability. The patient returned 2 months later to discuss the findings. The pertinent axial and coronal MRI images are shown in Figure 2. Figure 2. 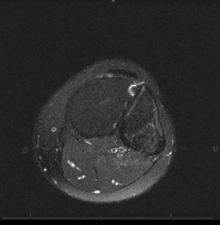 MRI of the left knee demonstrating ligamentous injury of her PTFJ. We had a long discussion with the patient regarding her diagnosis and options for treatment, including the possibility of left knee open PTFJ reconstruction with hamstring autograft and peroneal nerve neurolysis. We discussed the nature of the surgery and the associated risks, as well as the postoperative recovery and rehabilitation protocol. The patient communicated her understanding of the risks and the decision was made to proceed with surgical fixation. Examination under anesthesia was performed, noting anterior tibiofibular joint instability with flexion beyond 90. A longitudinal incision was made from the lateral epicondyle extending distally half way between Gerdy’s tubercle and the fibula. The peroneal nerve was identified just proximal to the fibular neck and a complete neurolysis was performed across the length of approximately 6 to 8 cm to give complete release of the peroneal nerve up to the anterolateral compartment fascia as it entered around the fibular neck. This allowed the nerve to be dropped away from the PTFJ for safe access to the site of joint reconstruction. Next, attention was turned to the fibular tunnel. The soleus muscle was dissected off the posterior aspect of the fibula and a retractor was placed posteriorly to protect the posterior neurovascular structures. A tunnel aiming guide (Fibular Marking Hook; Arthrex, Naples, Florida) was used to drive a 2.4-mm guide pin from anterolateral to posteromedial through the fibular head, exiting just distal to the fibular insertion of the popliteofibular ligament. The tunnel was over-reamed with a 6-mm reamer with meticulous protection of the peroneal nerve and posterior neurovascular structures. A #2 FiberWire suture was passed through the tunnel and clamped into place. It will be used for passing of the graft later in the case. Next, attention was turned to the tibial tunnel. The flat spot distal and medial to Gerdy’s tubercle was identified as the starting point and the tunnel aiming guide was once again used to drill a 2.4-mm guide pin posteriorly through the tibia at the same level as the fibular tunnel, exiting adjacent to where the fibular tunnel exited posteriorly. Again, the tunnel was over-reamed with a 6-mm reamer with protection of neurovascular structures. A #2 FiberWire suture was passed through the tunnel for later graft positioning. The hamstring was then harvested. An oblique incision was made at the anteromedial tibia and the sartorial fascia was incised in line with the gracilis and semitendinosus tendons. The gracilis and semitendinosus tendons were both harvested in standard fashion using a tendon harvester. Excess muscular tissue was removed in standard fashion and they were placed side-by-side to create a robust graft that would fit through a 6-mm sizing tube. The tendon grafts were whip-stitched together at both ends using #2 FiberWire suture. The graft was then passed from anterior to posterior through the fibula using the passing suture until just a small amount of tendon was left overhanding the anterior edge of the tunnel at the proximal fibula. A 6-mm x 23-mm BioComposite screw (Arthrex, Naples, Florida) was placed across the fibular tunnel, fixing the graft into position. The graft was then shuttled from posterior to anterior through the tibial tunnel and the knee was taken through a full range of motion to remove creep from the graft. The knee was placed at 70 and maximal tension was placed on the graft at the anterior aspect of the tibia, ensuring that the proximal tibofibular joint was stable and reduced. A 7-mm x 28-mm BioComposite screw was placed into the anterior tibial tunnel for final fixation of the graft, flush with the anterior edge of the tibia. Excess graft from the anterior tibia was removed. After ensuring once more that the PTFJ was stable and the peroneal nerve was free of any adhesions or constriction, the wound was copiously irrigated and closed. The patient was placed in a brace locked at full extension postoperatively. Her postoperative AP and lateral radiographs are shown in figure 3. Figure 3. Postoperative radiographs demonstrating tunnels drilled for graft placement in both the proximal tibia and fibula, with good alignment of the PTFJ. The patient remained non-weight-bearing and in a brace locked in extension for the first 2 weeks after surgery. At her first postoperative clinic visit, she was found to have 0 to 60 range of motion of her knee with no residual peroneal nerve symptoms. She was instructed to begin physical therapy for range of motion of the left knee and remain non-weight-bearing until her next follow-up visit in 4 weeks. She was also instructed to avoid sitting cross-legged or squatting beyond 70 of knee flexion for 4 months to ensure maximal healing. At 6 weeks after surgery, she was allowed to resume gentle, graduated weight-bearing while continuing to work on range of motion with a physical therapist. At 3 months after surgery, she remained symptom-free and was cleared for early phase gentle return to horseback riding. At 6 months postoperatively, she continued to be asymptomatic and was cleared for full return to sports. New radiographs and axial MRI from 1.5 years after surgery (Figures 4 and 5) demonstrate a healed, well-reduced PTFJ reconstruction. Figure 4. 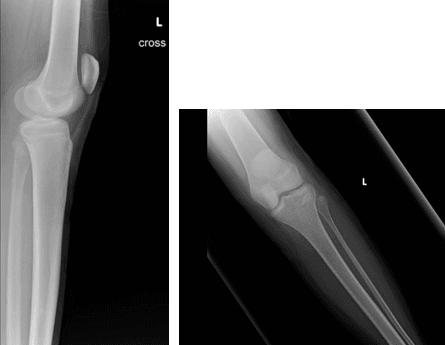 Radiographs taken 1.5 years after surgery show anatomic graft tunnel placement in the proximal tibia and fibula, with the PTFJ remaining in good alignment. Figure 5. 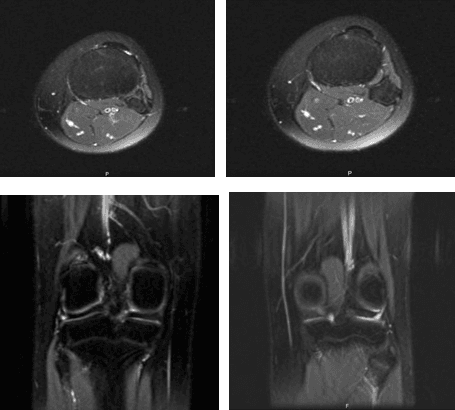 Axial MRI of the left knee shows an intact PTFJ reconstruction 1.5 years after surgery. The peroneal nerve should be carefully mobilized from all entrapping scar tissue and compressive fascial bands. Ensure that it is well protected during tunnel preparation and graft passage. If the semitendinosus tendon is less than 6 mm in diameter, as in this case, the gracilis tendon can also be harvested to increase graft diameter. Maintain proper tension on the tibial limb of the graft while the knee is flexed to 70 during placement of the second interference screw. While drilling the tibial tunnel, avoid blowout of the lateral tibial cortex by confirming that the PTFJ is reduced and that there is sufficient exposure of the flat spot distal and medial to Gerdy’s tubercle. The incision may need to be extended distally for adequate exposure in obese patients. PTFJ instability is a rare, yet challenging issue for patients and orthopaedic surgeons alike. Although many patients improve with conservative measures alone, a significant number will go on to develop chronic instability and ultimately require surgical fixation. Several soft tissue reconstruction procedures have been described in the literature; however, at present there is no consensus on the optimal surgical technique for definitive fixation of ligamentous disruption of this joint. The goal of operative treatment is to create an anatomic reconstruction of the ligamentous structures in order to restore joint stability and allow the patient to return to sport and activities of daily living without limitations. In this case, we performed an anatomic PTFJ reconstruction using a gracilis and semitendinosus autograft fed through tunnels in the fibula and tibia. Although the PTFJ technically has both anterior and posterior ligamentous structures, prior studies have shown that the majority of PTFJ instability motion occurs in the anterolateral direction, which is chiefly stabilized by the posterior ligamentous structures. [4,14] In addition, the anterior ligaments consist of 2 to 3 thick bands that are reinforced by the biceps femoris tendon, whereas the posterior ligament is a single, thin band, making it more susceptible to injury [14, 15]. Two-limbed reconstruction of both the anterior and posterior ligamentous bands may be prone to over constraint or other errors in tensioning because it does not allow for differential tension to be applied to each limb. Thus, we elected to reconstruct only the posterior ligamentous band, which has previously been shown to provide adequate PTFJ fixation after instability . Our case study also provides MRI imaging confirming healing of our graft and anatomic reduction of the PTFJ. In general, surgical reconstruction of the PTFJ in cases of chronic instability gives good results in terms of functional outcomes and patient satisfaction. Ligamentous reconstruction using an autologous hamstring autograft, as described here, provides a stable anatomic construct that alleviates knee pain and peroneal nerve symptoms without compromising the posterolateral soft tissue stabilizers of the knee. Yehuda E. Kerbel, MD, is a resident in the Department of Orthopaedic Surgery at Drexel University, Philadelphia, Pennsylvania. Nimit Patel, MD, is an orthopaedic sports medicine fellow at The Rothman Institute, Philadelphia, Pennsylvania. Sommer Hammoud, MD, is an attending surgeon at The Rothman Institute, Philadelphia, Pennsylvania.